Facebook Dating is finally ready for a bigger stage, four months after the social network announced its new, free dating service. A month after testing Dating on its own employees, Facebook said it has started tests in Colombia. Unlike Tinder’s swiping model, Facebook Dating asks its users questions and starts chats using information provided in a user’s profile. In a bid to lure more users, the company encourages people to meet in public using Groups and Events from within the service. Facebook Dating is only available through the Facebook mobile app, under the Menu button. The company has yet to announce plans if a desktop version is in the works. You can opt in right away if you are 18+ years old. Apart from being free, Facebook Dating is devoid of any ads or premium features for now. Once you choose to take part in the service, you have to create a private profile for dating. It only copies your first name and age from your original Facebook profile. Then, you can add a short bio or intro to describe yourself and who you are looking for. The profile comprises of photos and answers to queries. It supports up to nine photos and answers on iOS and 12 on Android devices for now. You can grab photos from the camera roll, Facebook, or Instagram. And Facebook will ask for your location to verify and avoid misrepresentations. Facebook finds matches within a 100-kilometer radius. No option to change your location, unless you move to a different place and confirm your new location. Facebook will disregard existing friends from your dating pool. Only friends of friends or strangers are considered. Blocked users will not appear in the pool. But an ex may still appear, even if you have unfriended him or her. 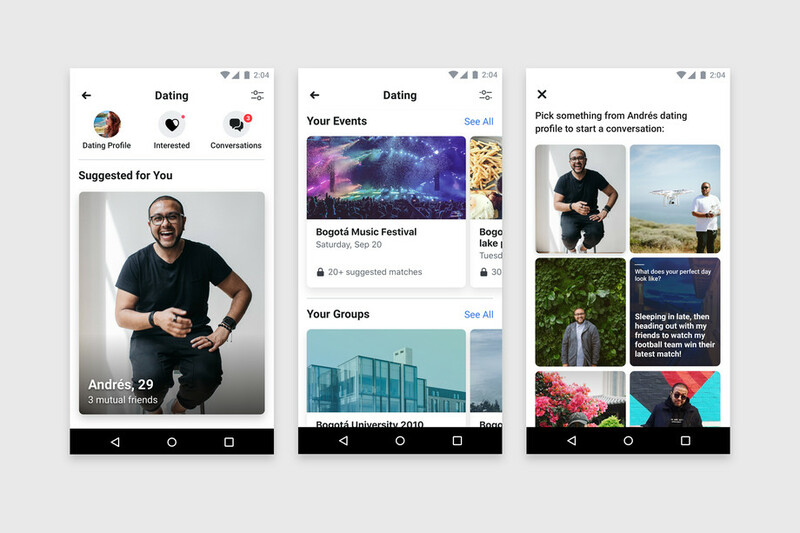 The algorithm considers your location, Facebook profile matches, shared page likes, and mutual friends to collect people for your dating pool. You get to select or filter prospects by tapping a photo or answer a question prompt. Then, you can add a note and send it to the person to express interest. That person can either reply or ignore your message invitation. Whereas Tinder matches dates before chatting, Facebook Dating allows you to send a message to anyone in your dating pool that you are interested in. A separate chat thread will open for each established connection. Only texts and emojis are available at this time, as there are no photos or videos in Facebook Dating messages yet. Although you can send unlimited messages to people you are already chatting with, you can only express interest for up to 100 profiles daily. If you’re part of a Facebook Group, you can opt in to show your dating profile to the group members. For Facebook Events, you can opt in for both upcoming and past events. Remember, this is only a test they are running in Colombia. We expect to see changes once Facebook Dating goes full blast. Facebook often tests new apps and features for more than a year. If Dating officially launches in Colombia, it may appear somewhere outside the Menu button. Better yet, the company may fork out a standalone app for it.